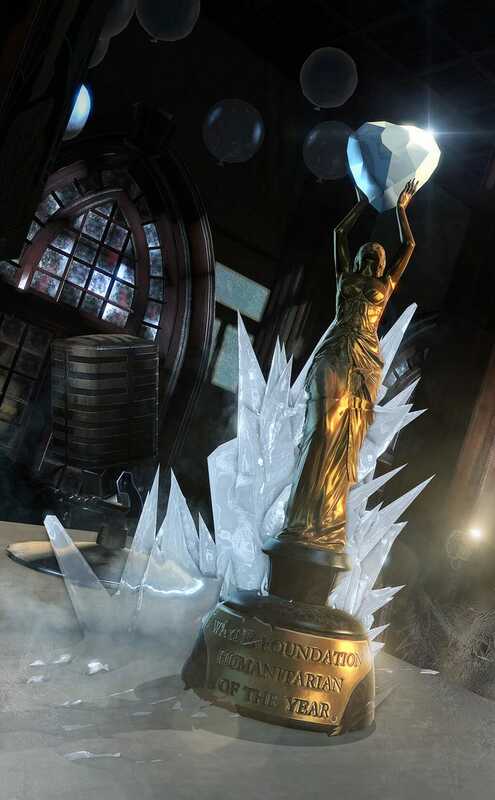 A giant diamond, some ice crystals, and an invitation to an awards gala at Wayne Manor? Sounds like Batman: Arkham Origins' upcoming story DLC is going to be one cool party. Does the Ice Man cometh? The Batman Arkham Twitter account promised a surprise for New Years' Day, and this looks to have been it. "All-new story DLC coming in 2014!" and the image you see here. This is after the account tweeted an invitation to Gotham's Humanitarian of the Year awards yesterday. What does it all mean? I mean, aside from Mr. Freeze, obviously. We knew story DLC was coming for Arkham Origins. Speaking to Eurogamer last year (love saying that), Batman Arkham Origins senior producer Ben Mattes said the story DLC for the game would "focus on one of the most key relationships in Batman canon." The question is, is that relationship Batman and Mr. Freeze, or is Mr. Freeze simply the villain of the story? Could Robin be involved? Is this a remake of Joel Schumacher's Batman & Robin? Okay, now I've frightened myself. Back to New Year celebrating.